When Minnesota became a state in 1858, the area now known as Macalester-Groveland was part of the Fort Snelling military reserve. This area, known as Reserve Township, was annexed by the City of Saint Paul in 1887. The Macalester-Groveland neighborhood is home to several post-secondary institutions, many of which date back to before a majority of the area was settled. In 1884, Macalester College moved to its present site at Grand and Snelling Avenues. The College of St. Thomas (now known as the University of St. Thomas ) was established in 1885 and the St. Paul Seminary was built upon its present Summit Avenue location in the early 1894. During the late 1880s and early 1890s, a unique residential area was developed immediately to the west of Macalester College. This area, known as “Tangletown”, has numerous winding streets and an eclectic mix of architecture. During the same period, a farm near the present intersection of Randolph and Lexington Avenues was developed into homes. In 1890, the first electric streetcar line was built in Saint Paul. This streetcar line helped to link the Macalester-Groveland neighborhood with downtown Saint Paul. The result of this connection was a significant amount of commercial and residential development along the Randolph and Snelling streetcar lines. A majority of homes in the Macalester-Groveland area date back to the era between 1915 and the late 1920s, when streetcar use was in its prime. Tired of potholes in our streets? It could be worse. 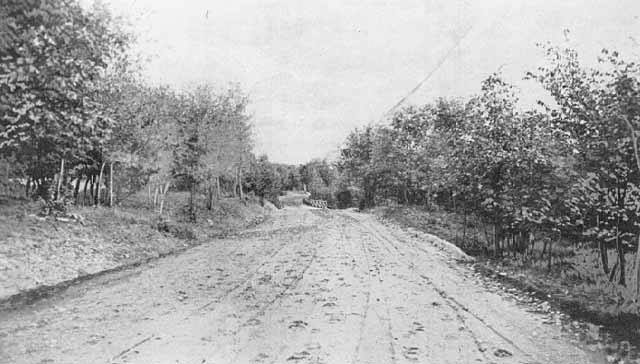 Check out this photo from 1904 of the road that is now Mississippi River Boulevard.